Below is an excerpt from the Regional Multiple Listing Service’s most recent “Market Action” report that comes out monthly and is e-mailed to all member Realtors. 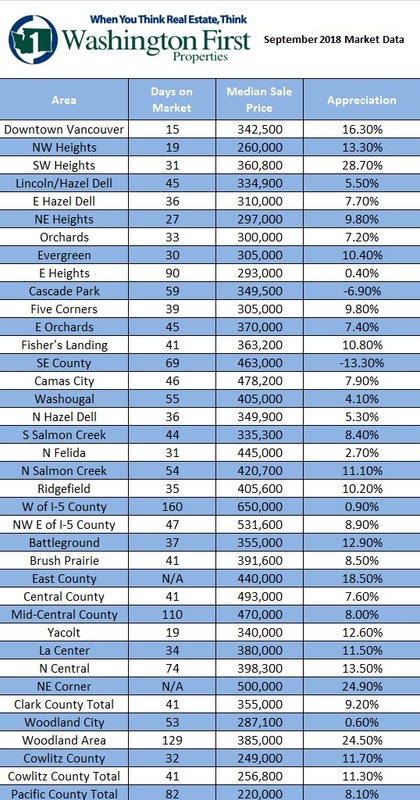 This is data specific to the Southwest Washington Area market. Southwest Washington started to see some cooler numbers in September, even compared with September 2017. New listings (951) fell 0.7% short of the 958 new listings offered in September 2017 and 12.2% short of the 1,083 offered last month in August 2018. Pending sales, at 689, ended 1.6%under September 2017 (700) and 15.1% under August 2018 (812). There were 677 closings in September, 9.7% fewer than in September 2017 (750) and 17.0% fewer than last month in August 2018 (816). Total market time decreased to 41 days in September, with inventory increasing modestly to 2.9 months. Comparing the first nine months of 2018 to the same in 2017, the average sale price has risen 8.9%from $360,400 to $392,300. In the same comparison, the median sale price has risen 9.2% from $325,000 to $355,000.